More than 100 high school students from Pennsylvania, Virginia and West Virginia spent the day at Stage AE April 15 for Point Park University's Sports, Arts and Entertainment Management High School Workshop. In the morning, students attended interactive sessions led by SAEM full-time faculty members Steve Tanzilli, J.D., David Rowell, M.F.A. and Ed Traversari, M.B.A., who gave an overview on the different facets of working in the sports, arts and entertainment industries. Seth Martin, admissions counselor, and Ashley Dobransky, School of Business assistant to the chair, were also at the workshop answering questions from the students. 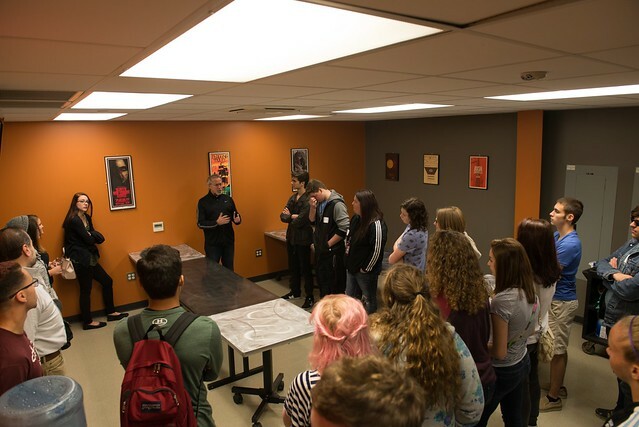 "It was great to see so many high school students eager to learn more about Point Park's SAEM program and Stage AE, one of the hottest venues in Pittsburgh," remarked Traversari. After lunch, students heard from Stage AE Office Manager and 2012 SAEM Alumna Alison Maternowski, as well as Mark Fritzges and Jesse Naus, music industry professionals who co-teach the SAEM Recording Business class at Point Park. Gabriela Zucckero Prise, a senior at Quaker Valley High School in Leetsdale, Pa., said: "I truly enjoyed every SAEM faculty member and speaker I had the privilege to meet. They are all highly experienced people who are passionate about their field of work and sharing their knowledge with students." "I really enjoyed getting to see the backstage area of Stage AE and learn about the process of getting ready for a concert," added Hayley Oakley, a senior at Heritage High School in Lynchburg, Va. "The SAEM faculty is fantastic. I loved the interesting stories they told us about their careers."